Algeria and Russia will face off in a World Cup 2014 Group H match on Thursday, June 26. Kick-off time is 4:00 p.m. EDT at Estádio Beira-Rio, Porto Alegre. The game will be broadcast on beIN Sports Arabia 1 HD and beIN Sports Arabia 13 HD in Algeria, as well as Rossiya 24, Channel One Russia, and Sport 1 Russia in Russia. The game will also air on ITV 4 UK, TalkSport Radio, and BBC Radio 5 Live in the United Kingdom, as well as UniMás, ESPN Deportes, Galavision, ESPN Radio, ESPN2, Univision Deportes En Vivo, and SiriusXM FC in the United States. Live stream is available on ITV Player and Watch ESPN. CURITIBA, Brazil (AP) — Thirty two years on from one of the most controversial moments in World Cup history, Algeria finally has a real opportunity to reach the second round of the World Cup for the first time. When it meets Russia on Thursday in Group H in the southern Brazilian city of Curitiba, Algeria knows that a second straight win will mean a place in the last 16. A draw would probably be enough too — unless South Korea secures a big win over Belgium, which has already qualified. After a late 1-0 defeat to Belgium in its second game, Russia can only hope to progress with a win. Should South Korea beat Belgium, it would then go down to goal difference between the Russians and South Koreans. Following the disappointment of losing its opening game to Belgium 2-1, despite being ahead for much of the match, Algeria is now back in contention after a convincing 4-2 victory over South Korea. It was Algeria’s first win in in the World Cup since 1982. The performance showed the team’s attacking intent with three of the changes from the first game introduced by coach Vahid Halilhodzic getting on the score sheet. Algeria has shown itself to be well-organized and technically assured, with midfielder Sofiane Feghouli directing much of the team’s play. Qualification could also help erase the bitter memory of 1982 when Algeria failed to progress to the second stage after West Germany and Austria played out a result that suited them both. The two teams, meeting a day after Algeria had won its last group game, knew that a 1-0 win for West Germany would put both through to the second round at Algeria’s expense. After West Germany took an early lead, the game drifted at walking pace and ended with the score unchanged. The embarrassing display prompted FIFA to introduce simultaneous kickoffs for the final group games. Russia, playing in its first World Cup since 2002, still has a reasonable chance of advancing. 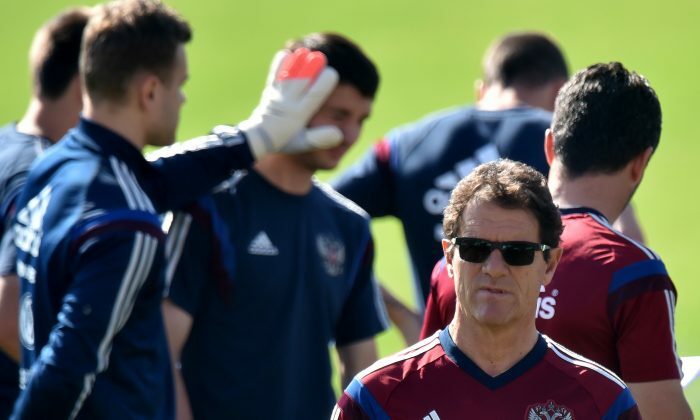 Fabio Capello’s squad of entirely Russian-based players has showed glimpses of potential and pressured Belgium for long stretches but lacked quality finishing during a 1-0 defeat. The team was also unlucky in its opening 1-1 draw with South Korea, conceding a soft goal when experienced keeper Igor Akinfeev let the ball slip through his hands. There’s no chance of Capello underestimating Algeria after his experience as coach of England at the 2010 World Cup. For many in England, the 0-0 draw against Algeria in a group game stands out as the most toothless display in a lackluster campaign, even more so than the 4-1 demolition by Germany in the second round. “We have no other option than to go out and beat Algeria,” Capello said, playing down any comparisons between the two games. If it fails to qualify for the next round, Russia knows it will be playing in the World Cup in 2018 through its status as host.